smart entrepreneurial thinking or a beautiful landscape can be the start of a future movement. We are aware of these developments and translate them in to inspiring visuals, color schemes and material developments. We think best while we work with our hands. Therefore research and development go side by side at Studio Tomorrow. The textile industry is a massive industry, but it all starts with fibers, dying processes and twining yarns. A small interference at the beginning of a process can cause an entirely different look and feel of the end product. Because of our experience in the carpet industry, we're well known with all textile related production processes. 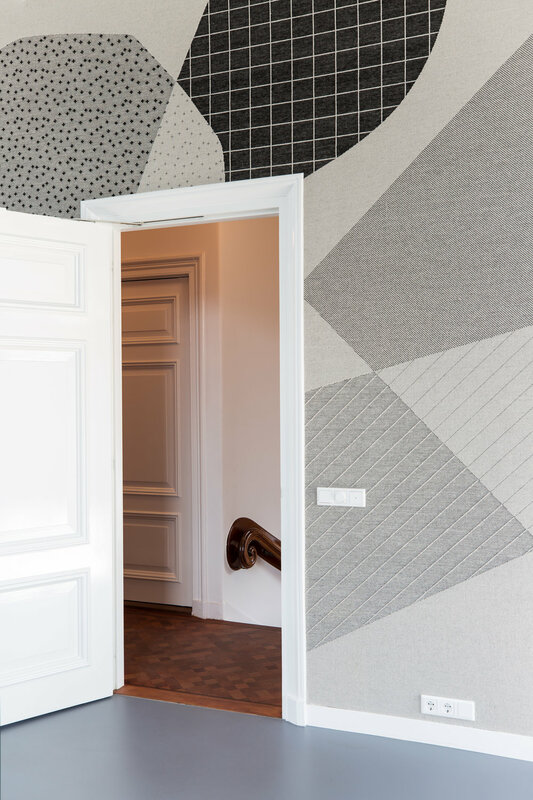 We're fascinated by the idea what well designed textiles can do for an interior and their users. They provide tactility, comfort and acoustic values. But more important, we use our textiles to emphasize the identity of a space. They reflect the soul of an interior and its users. We dig in the past, gather today and draw conclusions towards the future. Besides having an eye for aesthetics and beauty, dignity lies in the manner we treat our materials with respect. Materials should be consciously chosen and treated with care. To come to a good design we give space to serendipity and letting intuition decide which way to go on one hand. On the other hand we have to listen to our moral consciousness towards keeping our earth alive. We believe this can go hand in hand. We see great opportunities in creating future durable materials with an eye for aesthetics and simply look attractive. We are questioning our role as interior designers nowadays: how can we use and maintain material in an honest way? We believe in strong identities. Words that characterize our designs are: tactile, colorful, conceptual, smart and honest. A building has got it's own character formed by it's history, surrounding and former inhabitants. These elements, combined with the identity of the new owner, are the fundaments we work with. Our designs are well balanced and out spoken at the same time. They have courage and a slight bold character, but never loose their eye for detail. And as aesthetic as our interiors can be, we're always searching for a slightly disbalance. A space should be pleasurable to live, work or just be. It's about adding value in users everyday life. To achieve this comfort, well used textiles are essentiel. Textile is always a big player in our interior designs; this can be in upholstery or for example a custom made curtain or wall carpet.